Working at the China Bear Rescue Centre in Chengdu was a dream come true. I knew by my third day it would be one of the most incredible and enriching experiences of my life and completely change me. Even now three years later, just thinking about my time there brings me so much joy. This centre was Animals Asia’s first bear sanctuary and the first of its kind in the world. It is a safe haven combining semi-natural rehabilitation areas with bamboo forest enclosures designed to provide the bears with a secure and stimulating environment. The bears received are in a terrible condition – suffering from a wide range of abdominal tumours and infections, often some form of heart or liver disease, physical impairments, as well as joint and mobility issues caused by years spent in cages. 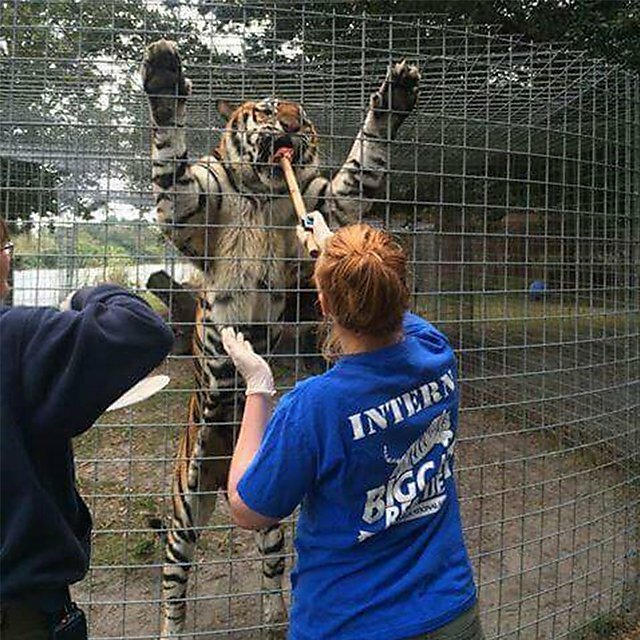 Despite their poor condition, most make a good recovery, partly because of their resilient nature, but also because of the professional care they receive from the veterinary team. I gained an opportunity to work at the centre through my placement while studying. Plymouth’s optional placement year really won me over when choosing a course – the flexibility they give you compared to other universities is second to none. This led to me being fortunate to spend three months as a behavioural volunteer in China, which ultimately led to where I am now, and I could not be happier. I was able to experience a wide variety of tasks, beginning with assisting the bear care team with preparing medical shakes and marshmallows to give the bears. With so many mouths to feed, and many of our residents having awful health conditions caused by life on a bear bile farm, we had to prepare over 100 shakes and marshmallows, all with different medications, ingredients and sauces – some bears are pickier than others and need something a little sweeter to convince them. Placing enrichment was another staple of the job – going in with the teams to try and hide different treats and toys – only to then watch as they found them all almost straight away. There was never any fooling them! It was so amazing to see them carry out natural foraging and playful behaviour, even after the horror they have experienced for so many long years. I also got to help carry out behavioural observations and projects required by the vet team, which aided them to decipher how certain bears were coping, whether they were ready for integrations, or if they needed additional treatment. The staff were kind enough to allow me to carry out my own project based on monitoring the social interactions and aggression of bears in their large groups – the data of which was used for my dissertation and was later published in the Plymouth Student Scientist Journal. Every day was so different, depending on the needs or the organisation. It was so interesting to see all the different tasks the team faced daily. We were allowed to shadow the vets on their daily checks for checking eyes, limbs and wounds, and sometimes I was lucky enough to help with these, which saw me clipping a bear’s particularly long toenails. I also had the responsibility of feeding and walking the local street dogs. The success of my placement motivated me to go backpacking around south-east Asia for three months after I graduated. I undertook several weeks volunteering with rescued pangolins at Save Vietnam Wildlife, as well as stray dogs and elephants at the Elephant Nature Park in Thailand. In my three month in China I found a company I knew I wanted to work for. 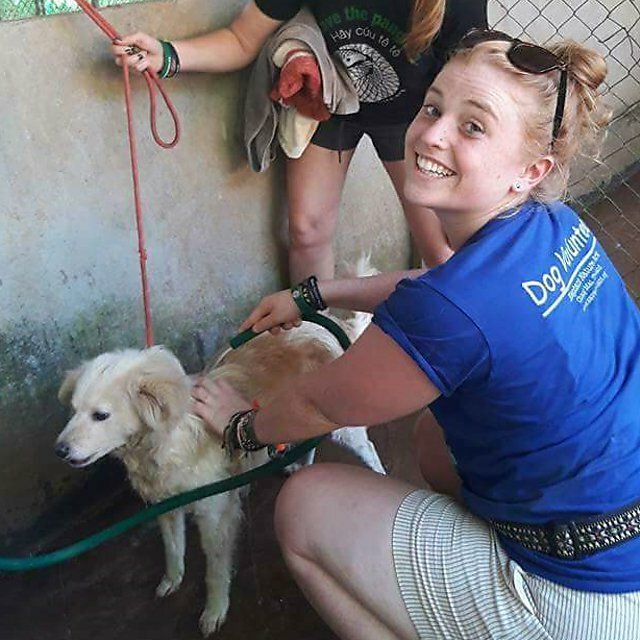 Fortunately this is what I now do – after graduating from Plymouth in 2016, I began working in the UK offices of Animals Asia in 2017, as a Senior Supporter Care Executive. For as long as I can remember my parents would take my brother and I to the zoo. They love animals as well and wanted that to shine through their children too. The more I learnt, the more passionate I became as I grew up. But as I got older, I became aware of the darker side. In my early teens I first learnt about the several different cruel practices happening to thousands of bears across Asia – bile farming, baiting and dancing, all horrific in their own way. I began to do fundraising to raise awareness and money for causes fighting against this cruelty, all from the classroom, and from there my determination grew and grew. Finding out about these bears at a young age gave me a focus, which ultimately led to me finding out about Animals Asia’s work and being fortunate enough to now work for them. I couldn’t believe this cruelty was happening and I was so desperate to help. Furthermore, when I learnt about the illegal trade for traditional Chinese medicine, which captures and slaughters endangered animals, including tigers, pangolins and elephants, merely for the belief that it may cure an ailment, with no actual scientific evidence behind it, it really made me want to be a part of the movement that changes this and teaches people that there is no need to be a part of this awful trade. I knew very early I wanted to study animals. I love biology and before I was even old enough to volunteer I was approaching volunteers to see how I could help. So, when the time came, it was just a case of deciding which area to focus on – biology, behaviour, zoology, conservation, welfare – there was so much to choose from. With that in mind, I looked at a variety of different degree choices, but found it difficult to find a University offering animal-related courses in a city, while other places seemed cut off from the outside world. Plymouth though has everything – the city, the sea, the national park – all the perks of a bustling city, but remains relaxed and not too overwhelming. It was after attending an open day at Plymouth I knew it felt like a perfect fit – a degree with a variety of components that, once I knew more about what I wanted to specialise in, I could do exactly that. Plus, seeing the variety of doors it had opened up to past alumni and the careers they ended up in, I wanted to have that choice as well. 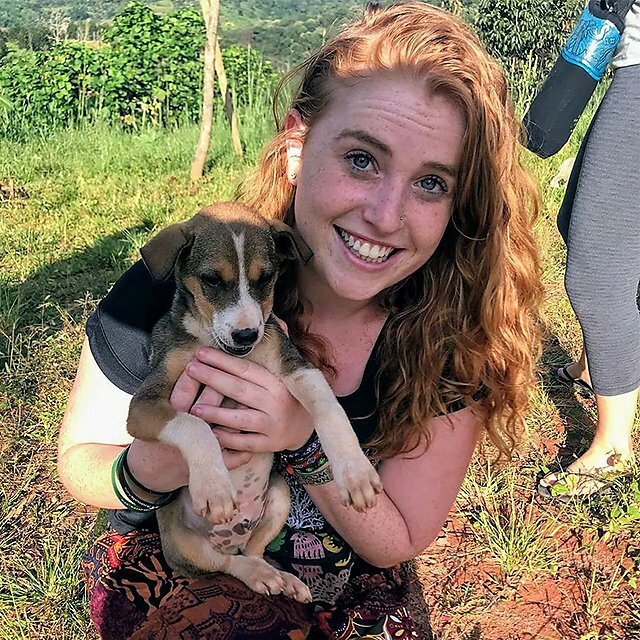 I always thought I would go straight into practical work with animals, but my degree showed me different aspects that I hadn’t considered: the study of behaviour, research, charity work, postgraduate opportunities – the list is endless. Plymouth prepared me for my career in several ways, having debates in seminars, giving a variety of different presentations to an ever-changing audience, as well as group work which vastly improved my presentation skills and teamwork. Some great field trips created lasting memories too, both in the UK and the Netherlands. The University also taught me how to adjust to a new environment, learn about work-life balance, as well as offering support when I needed it in the form of supervisors and mentors. To complete a perfect circle, during my time studying I became a vice-chair and secretary for two societies, which allowed me to instill my enthusiasm in other’s and make people as passionate as I feel. I was also a student ambassador in my second year, which was an amazing job that allowed me to encourage potential students to come to Plymouth for the same reasons I did. 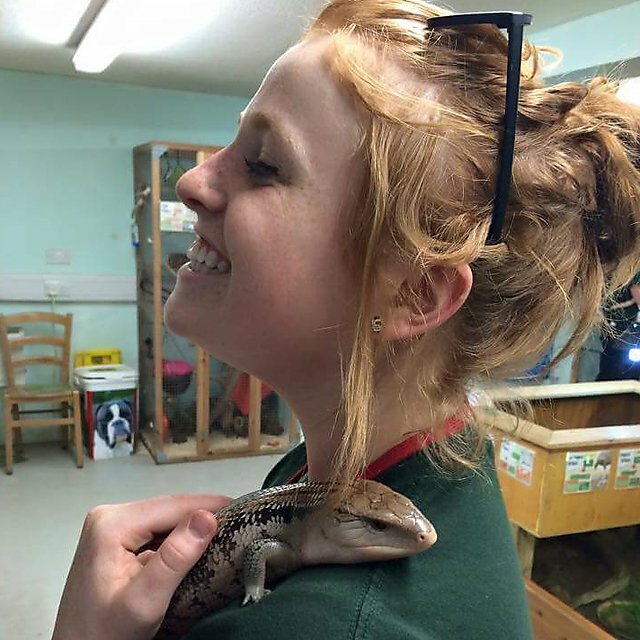 I have since met animal behaviour and welfare students who have said ‘I remember you from the open day, I want to do what you did.’ It’s great to know my passion inspired others to come to Plymouth and do the same degree. Animals Asia brings communities together through a variety of approaches. We work with animal ambassadors who embody the ideal that empathy for one animal can evolve into empathy for an entire species and ultimately for all species. For example, our Dr Dogs and Professor Paws programmes work deep within local communities, helping to inspire both recipients of their unconditional love, and the public at large, and conveying the message that dogs are our friends, not food. We take a non-partisan, sensitive approach in working with governments, authorities, experts and local communities. We work with, not against, people to find sustainable solutions for all parties. We inform and empower local communities for the welfare of animals and people, promoting change at the grassroots level while also promoting alternatives to animal products for use in traditional medicine, and provide training at veterinary universities in China and Vietnam, developing capacity training and best practice for both medical care and animal welfare. Finally, we work with vet and bear-care teams, field officers and a network of research scientists, university students, pathologists and traditional medicine doctors to investigate the bear bile industry, the trade in cats and dogs for their meat, and cruelty to animals in captivity – and use this knowledge to expose and fight against these practices. Our investigations provide the authorities with the tools to both end illegal practices and work with communities towards positive change. Our three main challenges are linked to funding, working globally and across political landscapes. As with any non-governmental organization (NGO), funding is always an issue. Given we are responsible for the lives of hundreds of bears, it's extremely important for us to have the necessary flow of funding to be able to care for our bears properly. Last year, in a historic move, we signed a Memorandum of Understanding with the Vietnam Administration of Forestry to work together to rescue the remaining bears still caged on farms across Vietnam – believed to be around 1,000. To make this happen, funding is going to become even more important as it will enable us to close the remaining bear farms in the country and build proper sanctuaries for those bears to be rescued, so they can live out their lives in peace. Technology is a wonderful thing. It enables us to work and connect within and across teams from almost anywhere in the world. It is still a challenge though working with a remote, global team – communications methods, internal procedures, and knowledge of ever-changing technological methods – all areas we need to continue to fine tune, so that distance is not an impediment to doing good work. We are the only foreign NGO to have a bear sanctuary in China and being in that unique position carries with it a huge responsibility. No one likes outsiders coming into a situation and telling them what to do. Since founding Animals Asia in 1998, Jill has done just that, and Animals Asia's remit is to provide solutions that even see those at odds with your mission comfortable with the road towards the goal. Do you share Lianne's passion for understanding animal behaviour and applying this to improve welfare? Do you want to understand the evolution of behaviour across a range of organisms? We apply an understanding of animal health and metabolism to help you understand a broad range of aspects of behaviour and welfare. Boost your employability by taking a placement year between your second and final years of study, working in the industry, anywhere in the world – just like Lianne did – priming you with the skills and experience highly sought by employers. 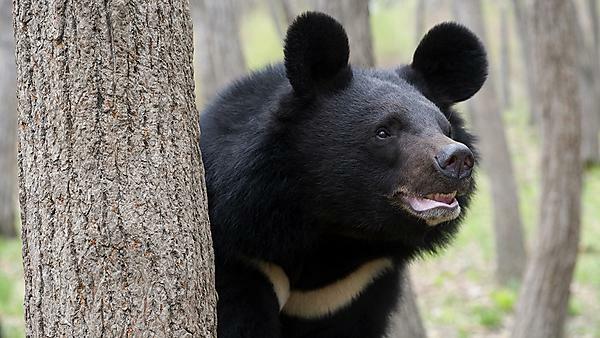 Asiatic black bears are one of the eight bear species in the world, along with black bears, brown bears, pandas, polar bears, sloth bears, spectacled bears and sun bears. Asiatic black bears are known as moon bears because of the crescent of pale fur on their chests. Every moon bear’s chest markings are different in colour and shape – from pale cream to deep orange-gold, from deep Vs to delicate crescents. Some are even speckled. The moon bear’s thick coat can be shaggy or flat, and is black or dark brown and forms a ruff around the neck. The female’s ruff is usually thicker. Moon bears also have distinctive large, round ears. Despite their size and weight, moon bears are excellent climbers, using their strong claws to help them clamber up trees or onto structures. The bears love foraging for food – and they really do love honey!